A portable stove is a stove specially designed to be portable and lightweight, as for camping. Simple single-burner stoves, often without any controls at all, that use solid or liquid fuel that is placed in the burner before ignition. Single-burner stoves that use volatile liquid fuel in a pressurised burner-tank combination. Single- or multi-burner bottled-gas stoves, which have controls to regulate the heat, similar to the controls on a kitchen stove. Gravity-fed spirit stoves, which have priming pans. The simplest stove is a burner that contains the fuel, and which once lit burns until either it is snuffed or the fuel is exhausted. The rise in the popularity of extreme light-weight equipment for extended backpacking, and the increasing restrictions on the use of campfires in most wilderness areas, have made these small stoves extremely popular. The two most popular of these are the solid fuel stove, using Hexamine tablets, and the liquid fueled stove using methylated spirits. Both types are available commercially. There are also many designs published for similar home-built stoves, like the beverage-can stove. While solid-fueled stoves may be carefully refueled while burning, with a liquid-fueled stove it would be reckless to attempt this. Both solid fuel and liquid-alcohol fuel, and stoves for using them, are produced by Esbit, and fuel is produced by several other makers. While most brands of firelighters can be used in such stoves, some types will produce a troublesome residue that may be impossible to remove from cookware, and will taint any food exposed to the flame or fumes. One popular make of simple liquid-fueled stove is the Trangia, available in many different models from a single bare burner to an integrated expedition cooking system. Some of these come with a sealing cover, allowing the burner to be packed while containing fuel; although, putting the lid on while the stove is hot can damage it. There is some controversy over the invention of the pressurised burner. Most have given the credit to F. W. Linqvist, who was granted a patent for a kerosene-fueled burner in the late 1880s and went on to develop the Primus brand of stove into a market leader. However, some have suggested that he bought the design. The Primus stoves and their imitators were a significant advance over previous designs, which had used a wick to supply liquid fuel to the burner by capillary action. The Primus burner vaporised the fuel in a loop of pipe, and used this both to supply the fuel to the burner as a gas and to maintain pressure in the fuel tank. Initial pressure was provided by a small, hand-operated pump. It was also necessary to pre-heat the burner with methylated spirits. 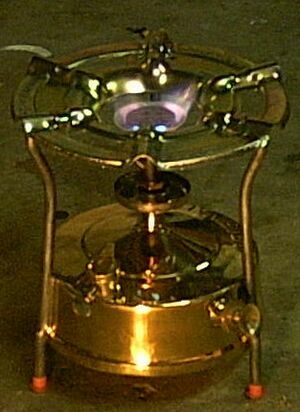 This burner design was also successfully adapted to portable lamps, lighthouse lamps, and blowtorches. 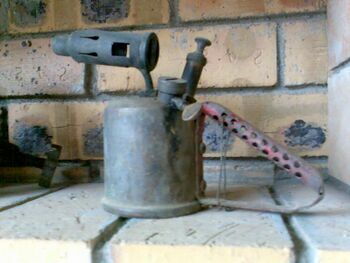 Kerosene pressure stove. The pressurising pump knob is protruding from the fuel tank at the lower right. Pressurised-burner stoves are now available to burn almost any volatile flammable liquid, including alcohol; diesel or other motor fuels; kerosene; jet propellant; and many others. Work is proceeding on vegetable-oil burners. Some can burn multiple fuels or even mixtures. Some require special low-residue stove fuel; others are designed to resist clogging or to be easily and regularly cleaned of the residue. Most pressurised-burner stoves provide some control over the amount of heat produced. Some fuels permit preheating (or priming) with the fuel; others require use of a more volatile fuel, such as methylated spirit or alcohol priming paste, for preheating the burner. Most provide an integrated pump for initial pressurisation; others require the use of a separate pump. A few, such as the later Optimus and Primus designs, need no pump, but pressurise themselves when the burner is preheated. Although heavier than the simpler designs and more complex to maintain and operate, these stoves can heat food more quickly. Standard issue to many units in the Second World War, they enjoyed a large base of competent users in the years immediately following the war. Another of their advantages is that hydrocarbon fuels have a higher heat content, weight for weight, than alcohol fuels, so that, for extended expeditions, the weight advantage of alcohol-fueled stoves is reduced or even reversed. The greatest variety in designs is in this category. They include gas-cartridge stoves and refillable gas-bottle stoves. In most of these the gas is stored as a liquid under pressure, but vaporises immediately as it leaves the storage bottle, arriving at the burner as a gas. Smaller, lighter designs tend to use non-refillable gas cartridges containing butane, propane or a mixture of hydrocarbons. There is little compatibility between different makers and systems, and cartridges for older stoves are often unobtainable. In addition, the single-use cartridges are considered objectionable by some on environmental grounds. Refillable gas bottles are heavier and tend to be used on larger stoves intended for car-camping or expedition base camps. However a great variety of gas-fired stoves is available, some integrating the gas cylinder, some connecting it by a hose. The traditional "spirit stove" still found in many pleasure boats is a unique design, largely replaced by gas stoves but still with a following. It consists of a tank that supplies methylated spirit under gravity to the burner or burners, where it is vaporised and burned. Around each burner is a priming pan used to preheat the burner. To light the stove, the burner is first turned on to allow a small amount of fuel to pass through the burner and collect as a liquid in the priming pan. The burner is then turned off, and the fuel ignited to preheat the burner. When the fuel in the pan is almost all gone, the burner is turned on again, and fuel passes into the burner where it is vaporised and passes through the jets. These stoves look and even sound a bit like pressurised-burner stoves, but the fuel tank is under no pressure. They remain popular for small boats owing to the minimal fire risk they pose in a confined space. Stoves differ widely in their size and portability. The smallest models are generally termed backpacking stoves. They are designed for use in backpacking and long-distance cycling, where light weight and small size are paramount considerations. Backpacking stoves consist only of the burner and any related systems, and some (usually crude) devices to support the stove and cooking vessel. The legs are collapsible to minimize the space required. The weight may range from about 80 grams to nearly one kilogram. Camping stoves are designed for use by people travelling by car, boat, canoe, or on horseback. They are similar in function and ease of use to kitchen stovetops, usually with two burners set into a table-like surface, and often with a folding lid for stowage and wind protection. This increases the weight to at least one kilogram, and sometimes as much as eight kilograms. A common problem in the use of stoves outdoors is the wind, which often tends to extinguish the flame. Even if it does not do so completely, it may extinguish it on the upwind side, reducing the stove's effectiveness, and cause the hot gas to flow away from the vessel being heated. 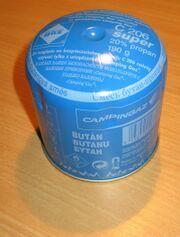 In camping stoves, the fold-out lid makes an effective wind shield, and some stoves also have protection on the sides. Most backpacking stoves do not include such features, as they would interfere with the stove's collapsibility, and many backpackers erect makeshift shields out of materials on hand. However, there are exceptions. For several stoves, there are specially designed cylindrical shields that are placed around the burner. In addition to keeping out the wind, they also trap heat that might otherwise escape. The VAR2 stove has wind protection shield which can be easily packed with cooking utensils, which protects the burner from wind and reflects the thermal radiation to the vessel. The Jetboil stove has wind protection integrated with the burner and the cooking pot. Many camping and backpacking stoves have piezoelectric self-ignition mechanisms so that they can be lit without a match. They use the mechanical work done by the operator in depressing a button to create an electric spark. These devices provide an advantage in windy conditions, because matches blow out easily. Matches are also less convenient to use, and pose a fire hazard if used improperly. Disadvantages are low reliability, additional (vulnerable) parts, and additional weight. Gas fuel is sold in canisters, typically under sufficient pressure that almost all of it is actually in liquid form. 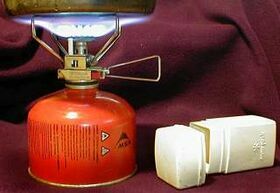 For backpacking stoves butane or a mixture of propane and isobutane are used. Camping stoves use either these or pure propane, which requires a particularly heavy-walled container. Alcohol, either methanol, denatured ethanol, isopropanol, or a mixture of these. These fuels lend themselves to use in simple wick-type stoves. Automobile fuel, usually known as either gasoline or petrol. Naptha, A purified form of automobile fuel, with a lower vapor pressure and slightly lower flash point, Sold under proprietary names like Coleman® fuel, Blazo™, or white gas. These products are most widely used in North America and are becoming more widely used in other countries nowadays. Heavier, less flammable fuels, variously called kerosene, paraffin, fuel oil, stove oil, jet fuel, diesel, biodiesel. Most stoves can use either liquid or gas fuel, but not both (One exception is Primus Omni/Multi-Fuel). Gas-fuel stoves are simpler to operate than liquid fueled stoves. The gas, being already pressurized, flows from the fuel canister into the burner, where it ignites, in the same manner as a domestic kitchen stove. Liquid-fuel stoves are more complex because the liquid fuel must be vaporized prior to burning. To accomplish this, the stove design brings the fuel line containing the liquid fuel near the flame of the burner. The heat from the flames converts the liquid fuel to a gas before it reaches the burner, where it mixes with air and is ignited. Some models use a spray system which does not require preheating. Most stoves operating with liquid fuels must be heated or primed before the burner is turned on. Many stoves require the operator to open the fuel valve briefly without igniting the fuel, so that it flows into a small pan. This small quantity of fuel is then lit and allowed to burn down. When the fuel valve is opened again, the fuel vaporizes from the heat of the pan. Some stoves do not have this apparatus, and must be preheated by the application of an external heat source such as a solid fuel block. In many stoves, the priming pressure is generated by a small hand pump that forces air into the fuel container. As the fuel is consumed, the pressure decreases according to Boyle's Law, so the pump must be operated occasionally during use to maintain steady stove operation. 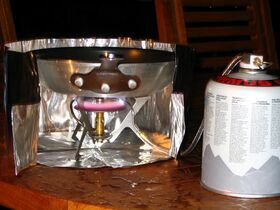 Liquid fuel stoves are the most popular for backpacking in United States. They generally operate well in cold weather. Liquid fuel costs less than gas fuel generally. Some forms of fuel, such as kerosene or fuel oil, are readily available worldwide. Disadvantages to liquid fueled stoves include they require priming, hence some skill is needed to operate them properly. Using liquid fuel stove in a tent is difficult or even dangerous. The fuel does not burn as cleanly as gas fueled stoves. Soot builds up on cooking vessels eventually. Spilt liquid fuel poses a fire hazard, and can soil equipment. The odor of the fuel may also attract dangerous wild animals. Gaseous fuels have many advantages; the fuel burns cleanly. They are quite simple to use, just adjust the fuel flow with a valve and light the burner. Since the gaseous fuel quickly dissipates, the fire hazard associated with leaking fuel is reduced. Safety is also increased because there is no priming, however undetected leaks in larger gas bottles can cause explosions. Gas fuel bottles of a particular make may be widely available in some countries but not in others, so international travelers have to be particularly careful. Some disadvantages of gas fuel are the difficulty of transferring fuel from one container to another and the difficulty of accurately gauging how much fuel remains in a container. Gas fuel is somewhat less efficient than liquid fuel, meaning more fuel volume is required for the same heat output. Gas fueled stoves usually do not operate well in colder temperatures. Butane in particular, does not vaporize well at low temperatures which makes stoves fueled with butane unsuitable for cold weather camping. Boiling point of butane under normal pressure is -1°C and under this temperature butane cannot be used as a fuel for gas stove. The temperature where use of butane becomes impractical is even higher (around 5°C). Propane-butane-isobutane mixtures used in most containers are suitable to temperatures of -10°C. Pure propane boils at -42°C which is the actual limit of usability of propane stoves. Gas fuel canisters tend to be heavier than liquid-fuel bottles, because it must be stored under greater pressure. When a canister runs out, it may have to be treated as hazardous waste. Canisters tend to deteriorate and leak if stored for several years. A quantity of liquid fuel sufficient to cook a meal, if simply placed in a container and ignited, would burn violently and consume itself in a matter of seconds, and a similar quantity of gas fuel would simply explode. The primary design principle of stoves that use these fuels is to provide a steady flame and prevent the fuel's escape. Solid fuel, however, is more manageable. A solid-fuel stove may consist of no more than a metal plate to hold the fuel, a set of legs to keep it out of contact with the ground, and some supports for the cooking vessel. This design is highly scalable, and may be used for anything from tiny backpacking stoves to large portable woodstoves. While admirably simple, solid fuel has several disadvantages. First of all, in most cases, its burn rate may be controlled only by varying the amount of fuel placed on the fire, while fluid fuels may be controlled precisely with valves. An exception to this would be the solid fuel burners which blow air on the fire via an electric fan (much like coal burners in China), such as ZZ Manufacturing's Sierra Stove; with these, various fan speed settings allow the operator to control the flame intensity. Second, no solid fuel burns completely. It produces considerable amounts of ash and soot, which soil both the stove and the cooking vessels. Some of the chemical energy of the fuel remains locked up in the ash and soot, so solid fuel releases less heat, gram for gram. Firewood may often be used in solid-fuel stoves, but manufactured fuels are also available. One type is sold in the form of hexamine tablets, on the order of a centimeter in size. This form, pioneered under the trade name Esbit, emits small amounts of cyanide when it burns, and should not be used in enclosed spaces. Sterno® (Canned Heat™) is a pink flammable gel that is also used in solid-fuel stoves. Simple stoves are sometimes used in ice houses and large tents, both to provide warmth and for cooking. They burn wood, and have a small flue used to exhaust the smoke. When used in tents, they are used in a larger tent made of fabric that does not burn readily, and are most often used in base camps that move infrequently. The widespread use of backpacking stoves began with increased awareness of the environmental impact that backpackers had on the areas where they travelled, beginning in the 1950s in parts of Europe and the 1960s in the United States. Prior to their use, the usual practice when backpacking was to build an open fire for cooking from available materials such as fallen branches. The fire scar left on the ground would remain for two or three years before the vegetation recovered. The accumulation of fire scars in heavily travelled areas detracted from the pristine appearance that backpackers expected, leading to more widespread use of stoves. This page was last edited on 17 January 2010, at 20:51.